The latest data from Inrix paints a dismal picture for folks traveling Wednesday (that’s today!) ahead of the Thanksgiving holiday. Drivers in Boston, New York City and San Francisco will see the largest delays with drive times nearly quadruple the norm, according to AAA and Inrix, which aggregates and analyzes traffic data collected from vehicles and highway infrastructure. AAA is projecting 54.3 million Americans will travel 50 miles or more away from home this Thanksgiving, a 4.8 percent increase over last year. It’s a record breaker of a year for travel. This weekend will see the highest Thanksgiving travel volume in more than a dozen years (since 2005), with 2.5 million more people taking to the nation’s roads, skies, rails and waterways compared with last year, according to AAA. The roads will be particularly packed, according to Inrix. Some 48.5 million people — 5 percent more than last year — will travel on roads this Thanksgiving holiday, a period defined as Wednesday, November 21 to Sunday, November 25. The worst travel times? It’s already here in some places. San Francisco, Chicago and Los Angeles will be particularly dicey Wednesday, with travel times twice to four times longer than usual. Other cities projected to have the worst travel times include Detroit along U.S. Highway 23 north, Houston on the north and southbound Interstate 45 and Los Angeles, particularly northbound on Interstate 5. Here are a few of the lowlights happening right now. These projections are based off of Inrix’s data. Delay times show how much longer travel times will be from the norm. I-680 north will be 311% delayed at 1:30 p.m. Even travel times to airports have increased Wednesday. Travel times from downtown Seattle to the airport via Interstate 5 south and Chicago to O’Hare Airport via the Kennedy Expressway will be particularly long. The Chicago route, for instance, is projected to take 1 hour and 27 minutes at the peak time between 1:30 pm and 3:30 pm CT. There are alternatives, of course. 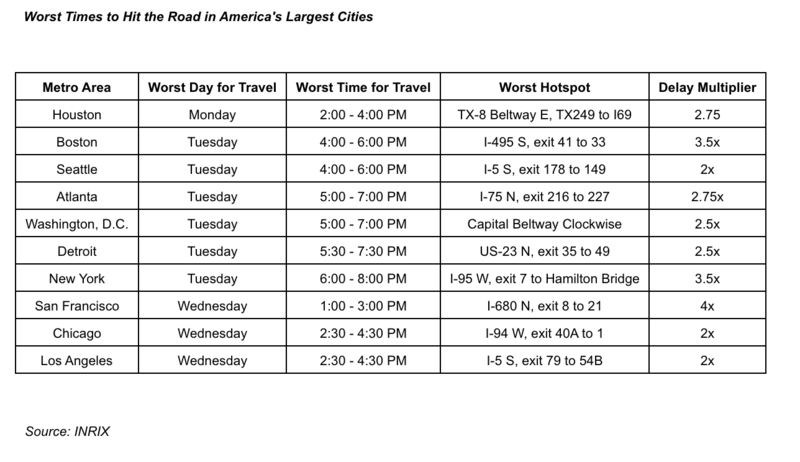 In most cases, the best days to travel will be on Thanksgiving Day, Friday or Saturday, according to Inrix and AAA.